The bodies are curiously well preserved, even though they have been buried for centuries, and they are brought for study to a New York research facility under the authority of highly acclaimed Dr. Frederick Orville. But soon after the investigation begins, things go terribly wrong. The demonic souls of the beings are reanimated...and they are hell-bent on terror. Dr. Orville and his team work tirelessly in an underground bunker, under military guard, desperately trying to develop a serum to counteract the havoc the zombie-like terrorists wreak on their numerous victims. As a descendant of the Axosyz, only Doctor Orville's daughter has the spiritual insight necessary to direct the scientists and reveal the forces of good they'll need to overcome the evil that has been unleashed. 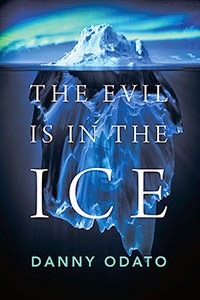 The Evil in the Ice is a fast-paced science-fiction thriller that takes the reader to a place where disbelief is suspended, faith in God is questioned, and the mystery of immortality is tantalizingly close to being unraveled. Lets say this book has a lot going on. It is a sci fi thriller, with mystery and intrigue oh yeah did I mention the zombies. Yes I said zombies . I settled down to read this book and wasn't expecting the thrill ride it took me on. It starts out with four well preserved bodies, that have been buried for it seems like centuries . Are transported to a New York research facility where Dr. Fredrick Orville supervises the investigation. Once started that is where things start to go terribly wrong . In the under ground bunker the demonic creatures come alive and this is where The doctor has to make a serum to get the creatures under control before they could get out and basically destroy the world. There is one person who might be able to get to the creatures and it is Dr. Orville's daughter . As a descendant of Axosyz. She is the only one that can help the team figure out the right course to be on. This is the first book I have read from this author and boy I was not disappointed in the least. The story was fast paced and once you start reading you just can't put the book down. You are questioning your own beliefs and immortality as you read. The author keeps us on the edge of our seats. Why at this moment in time why were the zombies unleashed from their tombs after centuries of being buried. Are they the ultimate terrorists wreaking havoc over the world population. I felt like that when reading . The author wrote with such an intensity it made me really wonder what would happen. Would we actually survive the onslaught. Will there be people to actually find the serum to help us out in time. This isn't your typical zombie eating, mystery, sci fi thriller. Like the Night of the Living Dead or even the Walking Dead. This the one book that will make you think and question everything about what could happen. This is a book that everyone should read if you love sci fi thriller and zombies this is the book for you . So check it out. You know you want to enter the world of zombies and the research. Read if you dare .